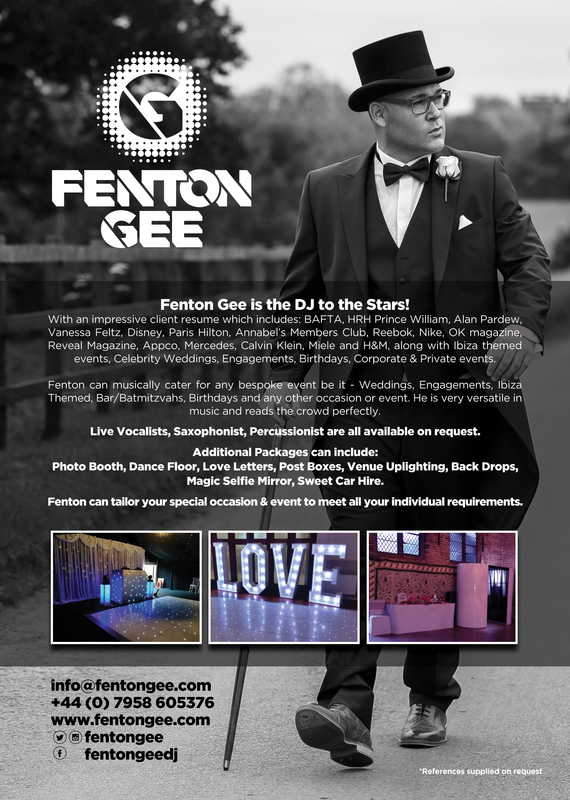 Fenton Gee is fast becoming one of the most popular DJs in the UK and the International club scene, whom can play any genre required! 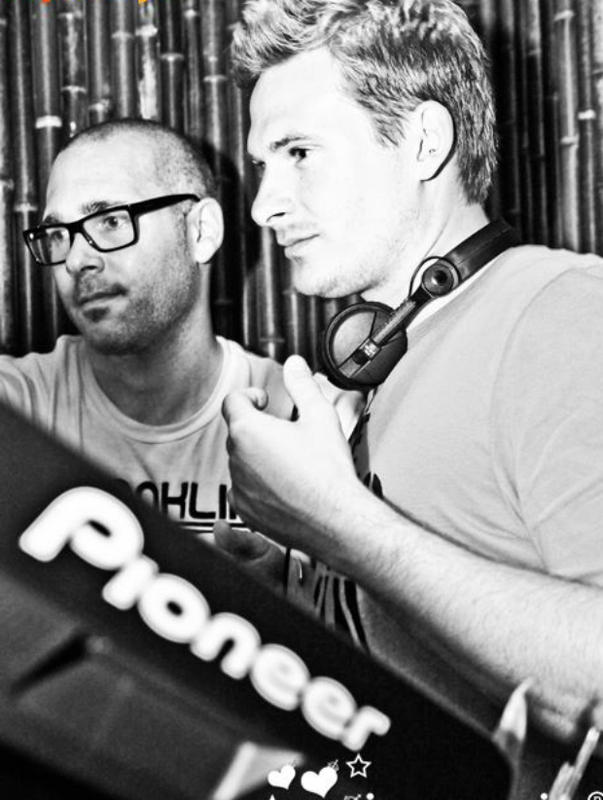 Former resident DJ at the exclusive private members club Annabels in Mayfair, follows on from his residencies at high profile London venues including Mahiki, Embassy and Club 24. 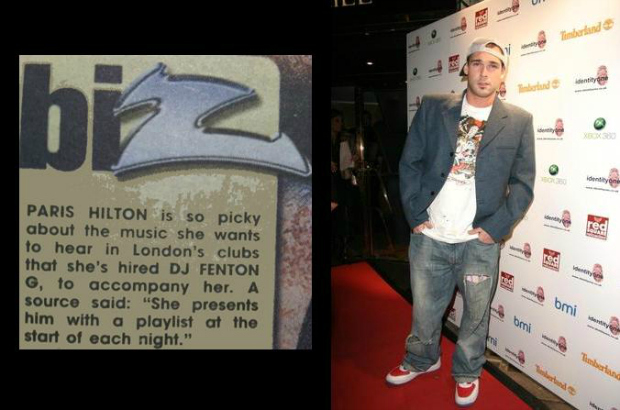 Fenton took the celebrity & corporate market by storm by being the most frequently requested DJ for OK magazine events, alongside regular DJ bookings for clothing brands Reebok, Calvin Klein, Franklin & Marshall and Bench. Having showcased his talents worldwide at film premieres, product launch events, festivals, back-stage VIP hospitality areas and in-store promotions Fenton’s musical versatility gives him the ability to play any style and genre required and requested for any event he plays at, Fenton also DJ’ed exclusively for HRH Prince William at a couple of his private events in London. Fenton has personally played for the President of Disney on several occasions and was the headline DJ at the BAFTA Awards in London. With the tagline ‘DJ to the Stars’ he was previously Paris Hilton’s personal DJ in the UK for many high profile events and he also has a very large portfolio of celebrity clients that he coaches in the skills of DJing too. 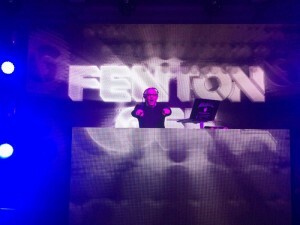 Fenton DJ’ed at both of our son’s Bar Mitzvah’s. Music plays an incredibly important part of any celebration. Fenton was excellent. We look forward to using him again at our next celebration. and were so pleased with the set he played. He also kept the floor moving for two hours solid. Fenton Gee did a fantastic job of DJing for the BAFTA Film Awards After Party at Grosvenor House, with his high level energy and fantastic mixes he really got the crowd going and filled the dance floor until the end of the evening. Fenton Gee is the perfect example of a class act. 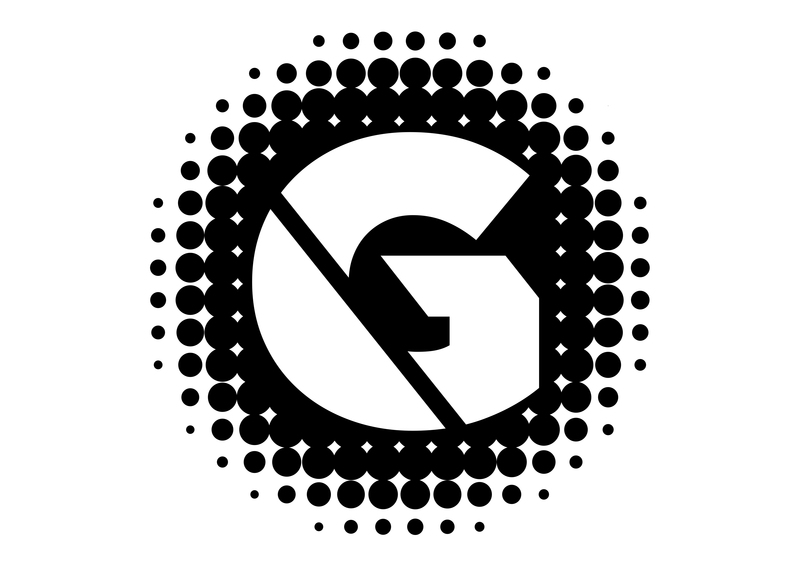 His versatile, house, tribal and personalised mixes have all hit the brief that we have requested, year on year. We have travelled with Fenton Gee to Manchester to Leeds, and he is yet to disappoint us. Fenton’s passion for music makes our company Conventions and Award shows unique, energetic, with delegates able to dance on their toes, almost making them forget they are at a corporate daytime event! Any DJ that can play non-stop for 7 hours straight is doing something right, works for us at Appco Group UK! Fenton dj’d for us at our wedding in November 2015 at Kew Gardens and we couldn’t have been happier. Everybody in the room was up on their feet dancing the night away, the tunes were soaring, the vibe was spot on, and he pleased the crowd with an amazing mix of genres for all. The atmosphere made the night so special and we couldn’t recommend him more. Thank you so much Fenton. Fenton Gee has DJ’d on a regular basis for me and is professional, energetic and always gets the crowd going with his sets. From Barmitzvah’s to regular Club nights his repertoire is versatile and he has a great can do attitude. I booked Fenton for my 30th through recommendation. Without briefing him on what genre of music myself and friends like, he created the best party atmosphere playing a fantastic set of old skool and r’n’b. It took us all back to being teenagers! Everyone commented on how great the music and ambience was and many went on to use Fenton for their 30th’s / weddings. 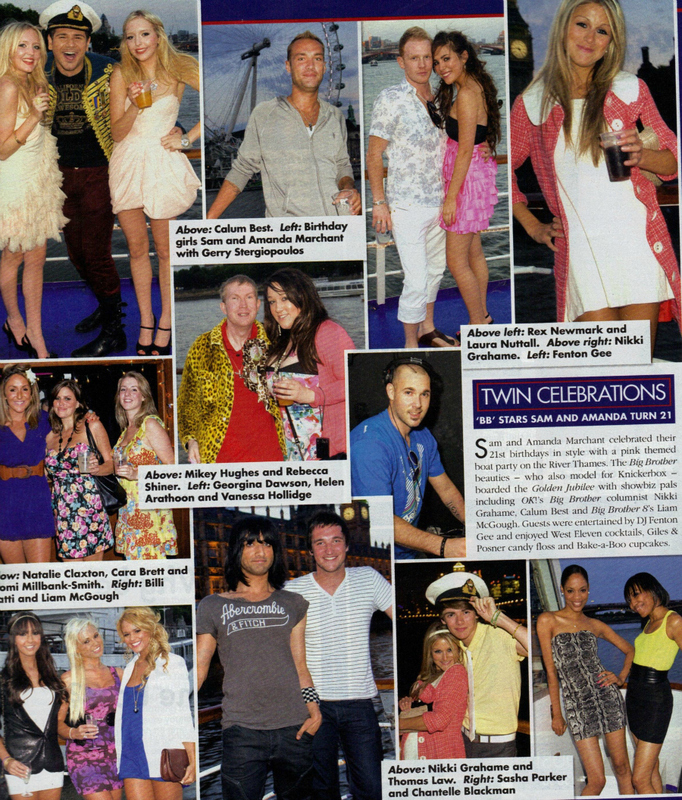 Trying to find an excuse to have a party now so we can book him again! A party is not a party without Fenton behind the decks! Prior my wedding, I had a meeting with Fenton to discuss what I would like to hear on my special day. I can only say he went above and beyond my already high expectations. He had the dance floor packed from start to end, with many disappointed the party had ended! Fenton plays more of a show, than your general DJ’s interacting with guests and playing to the crowd. He was professional, easy to communicate with and I would recommend him to anyone of any age that wants a good party! “For our wedding we were really keen to find a Dj which wasn’t your typical ‘wedding Dj’ Fenton was recommended to us by a friend. We arranged a meeting to discuss music and I instantly knew he would be great. He understood exactly what we wanted and we were able to just leave him to it. On the day Fenton played the most amazing music, incorporating all of us requests. Even to this day our friends and family still remark on how great the music was. We found Fenton to be super friendly and professional. Well before our event Fenton was helpful in getting not just what we wanted played, but avoiding what we did not want to be played. On the night we had loads of fun and the dance floor was much busier for much longer than we expected.